This is our first "formal" opportunity to welcome new DR K-12 PIs, and welcome back those of you who we haven't seen since the June PI Meeting. Thanks to all who participated in making this one of the most successful annual meetings. From evaluations, it appears that many of you perceived a good balance of small and large sessions; feedback sessions and collaborative presentations; poster sessions and working groups. You also appreciated the three new Crossroads sessions in which presenters asked for your guidance as they shared their vexations and ventures. At the current time, there is no PI meeting scheduled for 2013. CADRE, with the advice of the National Science Foundation and our advisors, will continue to offer other opportunities for networking, sharing learnings and experiences, and building new knowledge. Let us know if you have suggestions about how we might support additional collaboration among DR K-12 colleagues! Please know that we remain committed to the support of early career researchers and developers through the CADRE Fellows program. Mark October 29th as the deadline for PI-nominated applicants! The most recent portfolio analysis is also complete, and it provides a good descriptive summary of what the current funding stream, and where there may be gaps in DR K-12 research and development. Several webinars have already made it onto our fall calendar. NSF and CADRE held a series of DR K-12 Solicitation webinars in September and earlier this month. In addition, the annual DR K-12 Nuts & Bolts session is scheduled for November 7th, 1:30-2:30pm EST. SIGs and workgroups are continuing their work from 2011-12. Should you wish to join a group, or initiate a group, please contact us at CADRE@edc.org. The following groups are open to new members: Formative Assessment; Gaming; Digital Science Curriculum, Engineering, and ELL. Groups’ purposes and activities are established on the basis of your interests and needs, available leadership from the PI community, and CADRE resources. We anticipate a good year, but want to also note the passing of one of our favorite NSF program directors, Dr. David Hanych, on September 14th, 2012. Arriving at NSF in 2005, Dave handled a range of projects in the DRL portfolio including a group of DR K-12 projects. He brought together his experience as a scientist, professor, and developer of instructional materials, to offer sound guidance and support to the PI and potential PI community. We invite new and returning awardees to take part in the upcoming NSF Nuts & Bolts webinar, hosted by CADRE on November 7 (Wednesday), 1:30-2:30PM EST. The webinar is designed to introduce awardees to the ins and outs of project management. This session is adapted from the in-person meeting previously held during PI meetings. Participants have regularly given this experience high marks in annual evaluations. The recording and slides from last year's session are available on the CADRE website for those who want a refresher. Register for the November 7th Nuts & Bolts Webinar here. The CADRE Fellowship is a competitive program providing a significant professional development experience for early career researchers and developers currently working on a DR K-12 project. Through program activities, Fellows gain exposure to research and development related to STEM education, gain insights into NSF and what it takes to be successful and effective researchers and developers, and network with DR K-12 PIs and Fellows from across the country. "Being a CADRE Fellow has bolstered my confidence in general and in my ability to be a funded STEM Ed researcher. I met so many helpful PIs who pointed me toward colleagues of theirs at the university where I accepted a faculty position." I believe the insider knowledge that I have gained from the PI meeting and the webinars and conference calls relating to NSF grant writing and employment opportunities will give my early career a boost. Deadline to apply for the Fellowship is October 29th. Each applicant must be sponsored by a PI or co-PI on a current DR K-12 project. Learn more about the Fellowship and application process here. The Language-rich Inquiry Science with English Language Learners (LISELL) project has developed formative and summative written-response assessment tools that integrate a focus on science inquiry practices with a focus on academic language development. They are interested in exploring the qualities of these assessment tools that might prove educative for all teachers and students, but particularly for English language learners. Here, educative assessments refer to assessments that are designed to enable teachers to better realize the intentions of assessment for promoting meaningful learning. That is, educative assessment materials should foster both student content learning and teacher learning about student meaning-making. The LISELL project would like to join together with other projects (in mathematics and/or science) that share similar or complementary interests in how to make better use of assessment to support STEM teaching and learning for ELLs. Read the description of Language-rich Inquiry Science with English Language Learners (LISELL) here. If you are interested in joining Educative Assessments to Support STEM Teaching and Learning for English Language Learners, contact Cory Buxton and Martha Allexsaht-Snider. After planning work by CADRE and a core group of project leaders, the work group is preparing to make substantive steps forward. Current plans are to develop a "systems-view" framework of formative assessment that accounts for various types and uses of formative assessment. The group intends to solicit broad input from the DR K-12 community on the framework, explore potentially useful spin-off products, and encourage the work of grantees on various framework components and issues. In a separate but related strand of work, CADRE and group members will develop a simple descriptive inventory of DR K-12 projects focused on formative assessment, and possibly develop profiles of projects. Invitations for future group work will be going out to those who expressed interest in the late summer, but if you are newly interested, contact Derek Riley (driley@policystudies.com) and we will add you to the list. Many NSF-funded projects are employing new measurement methodologies as they develop and test e-learning environments. In the current project spotlight, we highlight these projects and the work of the New Measurement Paradigms work group (an active subset of the larger DR K-12 assessment community) whose members have examined the current state of technology-enhanced measurements for assessment in DR K-12. Their work culminated in an April 2012 report on New Measurement Paradigms as well as a presentation at the 2012 AERA Annual Meeting. Learn more in the New Measurement Paradigms spotlight, which includes the New Measurement Paradigms poster hall. Congratulations and welcome to all recently announced DR K-12 awardees! Download a list of recent DR K-12 awards with links to project descriptions here. Many thanks to presenters and attendees for making this year's meeting a success. We encourage you to take advantage of the following meeting-related content on the CADRE website. 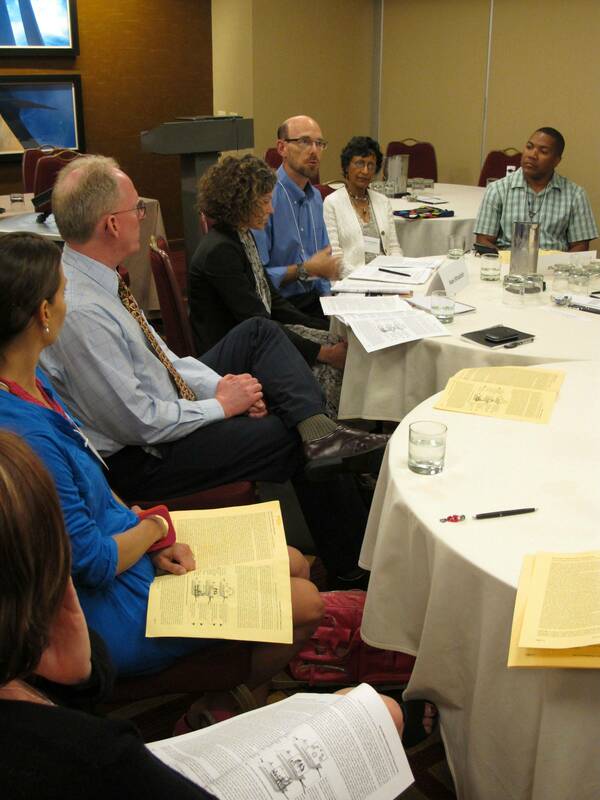 In a CADRE blog post, John Settlage reflects on the Crossroads session format introduced at this year's PI meeting. The sessions provided an opportunity for PIs to draw on community expertise to address project-related challenges. Topics ranged from issues with remote collaboration to disseminating significant findings around teacher induction to schools and universities. "Battling isolation is a continual challenge for science and math educators. As a novice science teacher, the closing of the classroom door effectively cut me off from all support systems. Later, as a university teacher educator, my interests in school-based teacher preparation isolated me from campus-bound traditions. And now, as a PI of an NSF project I realize that running a grant-funded project brings new ways to feel alone. Even with a marvelous team, I am "chief worrier" who has to make sure everybody else is making contributions that are satisfying to them and allow us to hit our project goals..."
Many of the posters presented at the 2012 DR K-12 PI Meeting are available for "virtual" visits and discussions. Stop by! Visit the 2012 Poster Hall. Slides and handouts are available for most PI meeting sessions. To download these materials, visit the online agenda and select the session(s) that interest you. Visit the 2012 DR K-12 PI Meeting Agenda. An important piece of CADRE's work as the DR K-12 resource network is the dissemination of research from DR K-12 projects. To that end, we ask that each project member fill out a survey regarding your project-related publications and upcoming presentations so that we can share your work with the broader STEM education community. This year we are also asking for you to share your project-related websites and/or social media sites (Facebook, Twitter, YouTube, LinkedIn, etc.) as well. We will share this information with the DR K-12 community and NSF, post it on the CADRE website, and include it in the Winter 2013 edition of the CADRE newsletter. Share your project's websites, publications, and presentations by completing this survey. This Compendium of measures is Part I of a two-part series to provide insight into the measurement tools available to generate efficacy and effectiveness evidence, as well as understand processes relevant to teaching and learning. Part II will look at student outcome assessments. The goal of these resources is to provide an overview of the current status of STEM instrumentation commonly used in the U.S. and to provide resources for research and evaluation professionals. CADRE is pleased to share a new brief suggesting practical ways of engaging teachers and other "end-users" in projects that develop materials for education in STEM. Projects described in this brief have benefited from school, district, and state users serving as Co-PIs, advisory board members, co-developers, implementation managers, data collectors, professional developers, and project emissaries to the broader field. The report highlights several ways in which users provide key contributions and insights into the development process (e.g., align products to the priorities of potential adopters and correct flawed assumptions undergirding development). Many thanks to DR K-12 grantees who contributed to the development of this resource: Heather Almquist, Marilyn Ault, Kimberly Brenneman, Tutita Casa, Sue Courey, M. Katherine Gavin, Patricia Gray, Hui-Yin Hsu, Jing Lei, Jackie Miller, Susan Pruet, Kris Scopinich, Judy Scotchmoor, Nancy Trautmann, Shiang-Kwei Wang, Yael Wyner, Dan Zalles, and Andy Zucker. Is it possible to reach out to previous or current DR K-12 funded programs for their insights and expertise? Can we apply to one strand but include elements from other strands in the same proposal? Is it permissible to include URL's in the proposal to direct the reader to additional information? If you missed out on the opportunity to participate, you can access the slides, recordings, and additional resources from all three sessions here. 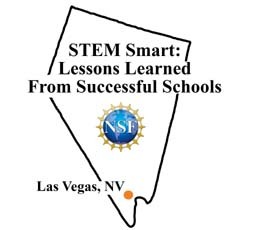 CADRE recently organized an NSF-sponsored event in Las Vegas, Nevada: STEM Smart: Lessons Learned From Successful Schools. This regional workshop, the latest in a series of workshops on successful STEM schools, focused specifically on using technologies to promote K-12 STEM learning and teaching. Plenaries and breakout sessions featured projects, resources, and initiatives that align with the National Research Council's report on successful STEM education along three different strands: Effective Instruction, Equal Access to Quality STEM Experiences, and Supportive Infrastructure for STEM Learning. Presenters included DR K-12 project members Bill Penuel, Carolyn Staudt, Edys Quellmalz, Alan Maloney, Sue Doubler, Marcia Linn, Cathy Kinzer, and Judit Moschkovich. The next regional workshop will be held in March. Review the agenda and download slides and handouts from the Nevada workshop here. Visit successfulstemeducation.org for additional resources and information on upcoming events. If you want additional information on CADRE or have specific questions, please email cadre@edc.org.